The newest novel by Mary Saracino tells the story of Madalene Ross, a thirty-year-old American who "lives in her head," cut off from her body, her heart, and her sense of purpose in the world. En route to and from her job as a computer programmer in Minneapolis, Madalene is hounded on the downtown streets by a homeless woman who asks "Got a match?" At night bizarre dreams haunt her sleep. Women fly through rooftops, chant in ancient temples, paint tongues of fire on vivid white canvases. Madalene's story is interwoven with the lives of three women: Rosalina, a priestess of Persephone in 70 B.C.E. Sicily; Ziza, a strega (Italian witch) in 16th century northeastern Italy, and Ibla, an herbalist and painter in 18th century southern Italy. Sicily's Lake Pergusa and the Black Madonna also act as a portal to the rich tradition of pre-Christian spirituality that lies beneath Church dogma. The Singing of Swans takes readers on a multi-century journey to uncover long-silenced traditions, crack Madalene's spiritual code and reclaim her soul. Elements of magical realism dovetail with historical storytelling as this compelling tale of redemption unfolds. "The Singing of Swans is a remarkable narrative calling—even compelling—us to connect with our own ancestral roots, to seek our own inner wisdom, and to reclaim our own inner voices!" 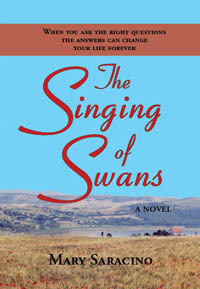 "The Singing of Swans is more than a novel. It combines an immense amount of learning, a great novelist’s ability to weave the present, the past, the far past, and the future into a spell-binding story…and to transmute all this into an offer of life to all of us trapped in contemporary deadening cultures. “In Sicily, an island that may be a metaphor for anywhere, Mary and I have both been overcome by the feeling that a terrible violence was done to women, a wound that continues to throb in our bodies. Because she is a highly gifted writer, Mary can lift this experience into an historically accurate, and searing, account of church and state persecution of good women—herbalists, healers, midwives called witches.